Bhutan uses 'Gross National Happiness' to measure human development rather than GDP. Last week I had the opportunity to visit Bhutan for the first time, a trip I’ve been looking forward to for many years. The country’s quest to buck the global trend of measuring human development success by Gross Development Product (GDP) and going instead with Gross National Happiness (GNH) has long intrigued me. How can we achieve happiness? It is an eternal question posed by many societies across the world. Many people still seek the answer. Yale University offered its most popular course ever last year with nearly 1,200 undergraduate students signing up to study how to lead a happier life. Successful businesses increasingly tend to the wellbeing of their workforce to maximize their competitive advantage. Why, then, when it comes to measuring development in our world, do we still primarily equate economic progress with better lives, and build a path to progress in 2019 around a 1930s metric? The World Health Organization warns that by 2030, depression will be the leading contributor to the global disease burden. So, should countries set out to make their people happy as a goal in itself? The answer, increasingly, is “yes”, with more and more countries expanding their measurement of success. From the UK to Costa Rica, from Sweden to Slovenia, governments are focusing more and more on analyzing the wellbeing of their citizens. New Zealand’s 2019 “wellbeing budget” will broaden its focus beyond pure economic and fiscal policy, using a broader set of indicators to measure success. In practical terms, this means child poverty figures will be presented at every budget and the onus will be on government ministers to demonstrate how spending proposals will improve people’s lives. Countries like these are following a recognized, if alternative, path forged by pioneers of measuring what matters. The tiny Kingdom of Bhutan, located in the heights of the Himalayan mountain range between China and India, is one of them. In 2008, the country enshrined the concept of Gross National Happiness in its constitution, a concept deeply-rooted in Bhutan’s society and the principles of Buddhism and focused on compassion, contentment and calmness. Even road signs in Bhutan project GNH, which has deeply permeated Bhutanese society, with street signs imploring people to, “Go green to keep our globe clean”. Bhutan first defined happiness: creating nine domains – psychological wellbeing, health, education, time use, cultural diversity, good governance, community vitality, ecological diversity and resilience, and living standards – and 33 indicators. Twice, in 2010 and 2015, the Centre for Bhutan Studies – a think tank in Bhutan’s capital city of Thimphu – carried out a national census-like Gross National Happiness Survey to measure with empirical precision the quality and depth of each person’s happiness over time. For example, in 2010, 59% of Bhutanese reported having positive emotions such as calmness, compassion, forgiveness, contentment and generosity a few times a week; by 2015 this had fallen to 51%. This is a unique dataset, which can drive forward-looking policy and decision-making. The impact of their policies and decision-making is significant: Bhutan’s poverty rate dropped from 12% in 2012 to 8.2% in 2017. As a deliberate derivative of the GNH approach, the Royal Government offers its citizens free basic education and healthcare, while villagers get much of their electricity for free. More than 50% of its land is designated for national parks, and more than 80% is covered by natural forests. Bhutan is carbon-neutral and has a net zero-carbon footprint. Espousing a different route to GDP does not mean the economy does not matter. It does. Even as one the fastest growing economies in the world, there is mounting pressure in Bhutan to create more jobs. In 2023, Bhutan is set to graduate from the world’s least developed countries group, signalling a potential change in the relationship between Bhutan and the rest of the world. For a small, geographically isolated country with a nascent private sector, the expected shift – from receiving development aid to advancing economic diplomacy – may be the greatest test yet. 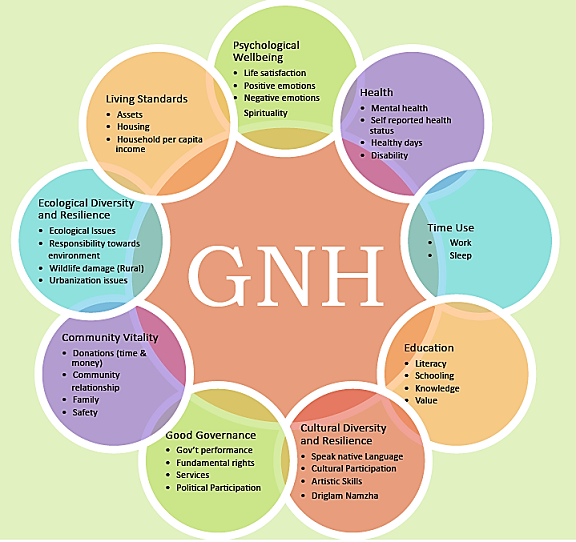 GNH – interpreted practically – can help. It can encourage business to measure success by the bottom line and the environmental and social benefits they offer, with new initiatives such as GNH business certification. And it can help track how people really feel about the changes in their society. The United Nations Development Programme, building on our 50-year relationship with Bhutan, has a significant role to play in supporting this smooth transition. We, too, are acutely focused on measuring what matters – a complex, ambitious list of targets captured in 17 Sustainable Development Goals to which the world, including Bhutan, have agreed. These goals set out an international plan of action for peace, people, the planet, prosperity and partnership, driven by the same ethos and instincts as GNH. The challenge for both the SDGs and GNH is how to translate such ambitious goals into practical development plans and implement them – how to ensure theory turns into practice. As UNDP, our journey in measuring what matters started with the Human Development Report, published for the first time nearly 30 years ago. The HDR imagined a world where income was not the only measure of wellbeing. Instead, human development would measure people’s choices and opportunities: whether they lived long lives, whether they were healthy, educated, and had sufficient income. It set out an index, ranking the countries in the world from top to bottom, based on their human development. Today, the data show that while human development is improving on average across the world, the steepest declines are seen in countries suffering protracted conflict. The Syrian Arab Republic, entering is ninth year of conflict in 2019, fell 27 places; followed by Libya, which fell 26 places; and Yemen, considered the worst humanitarian disaster in the world today, which fell 20 places. The index presents a stark picture, but by measuring what matters – beyond only GDP – the data shows how fragility and crisis block the arteries of progress. As the international community, it helps us figure out where to focus our efforts, such that no-one is left behind. So, too, does GNH, though the interpretation of happiness is more complex than the indicators behind the Human Development Index. If people are less happy or satisfied, is it a result of worse conditions, or growing expectations, for example, and how should this influence decision-making? UNDP will continue to look to and learn from pioneers in measuring what matters, like Bhutan. This year, the Human Development Report will paint a detailed picture of inequality, with new data that will go further beyond income and averages. The International Day of Happiness is a good reminder that our world is changing. If we want to understand how we progress, why we sometimes fail, and, ultimately improve the quality of all our lives, then the pursuit of happiness may offer an answer.